Al and Larry are long time fly fishing friends from St. Louis, Mo., and we had a great time fly fishing with them last week on the Little Red River. Both of these guys are top notch fly anglers that have done a lot of fly fishing in many different locations for multiple species of fish. They are both members of the Ozark Fly Fishers Club and regulars at T. Hargrove Fly Shop in St. Louis. If you are ever in St. Louis be sure to stop by the shop as it is one of the most unique fly shops in the country and you will really enjoy your visit. Check out www.thargrove.com. Al is the webmaster for the fly shop and also has his own website: www.moflyfishing.com, which focuses on fly fishing in the state of Missouri. Anyway, back to the fishing. We started on a beautiful fall morning and we were greeted on the river with an early morning midge hatch; but oddly enough we could not get a fish to take a midge pattern. 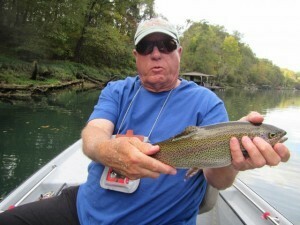 Regardless, a #16 Born’s Hairy Legged Sowbug and an #14 RG/PT Cruiser produced a number of nice Rainbows for Larry. Al stayed with his Pheasant Tail and Midge dropper patterns and as we drifted through Moss Dam Al high sticked a nice slot Brown Trout. As the morning progressed and as the midge hatch subsided, you guessed it, Larry started taking fish on #18 Olive Zebra Midge. Al continued with his own fly patterns, the names of which we will not divulge here, and both guys caught fish at a very rapid pace. At noon we met up with two more of the St. Louis group and we all enjoyed a relaxing lunch on the river bank complete with lots of fly fishing adventure stories. After lunch we ran about three miles down river as the water was continuing to fall. 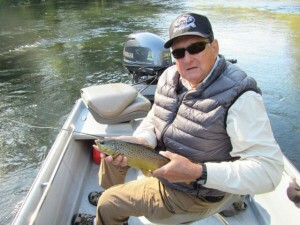 Al continued to fish his fly patterns and while Larry had been fishing Bo’s flys during the morning he decided to fish his own patterns during the afternoon session. Both anglers are wonderful fly tiers and they used a number of various fly patterns all of which worked very well on our Little Red River trout. Bo was also very interested in the short, seven and one-half foot, leader that Al fished throughout the day. In theses lower water conditions the short leader worked perfectly and would definitely be a lot easier to for beginning fly fishers to cast. Obviously you can always learn something from a really good fly fisher. All in all it was wonderful day on the river and an amazing number of fish brought to the net including one of the last fish of the day for Larry which was a beautiful slot limit Rainbow. We definitely hope both Al and Larry will come back and fish with us again.